Speak and be heard, clearly. Our Cloud PBX / Hosted VoIP platform was designed with premium voice quality in mind. By selecting higher quality VoIP Codecs, Tier 1 Carriers, and optimum call paths, we aim to provide a VoIP experience right inline with, (or some cases better than), the Public Switch Telephone Network (PSTN). Get bandwidth optimized, voice paths. We select the highest codec available based on the call type (internal or external) and direction (inbound or outbound), on a per call basis. We can also adjust the VoIP quality, granularly, for each phone on your Hosted PBX or for your entire PBX / Business Phone System. Generally speaking, the higher your Internet bandwidth (or speed), the higher quality you can theoretically achieve. Your overall VoIP experience will only be as good as your Internet connection. For Small Businesses, we recommend at least a mid-packaged Broadband Cable or FiOS / Fiber Internet connection. You will also benefit from a QOS aware Network Router and a POE based Gigabit Switch. Internal calls on your Cloud PBX will select the High Definition G.722 Codec. 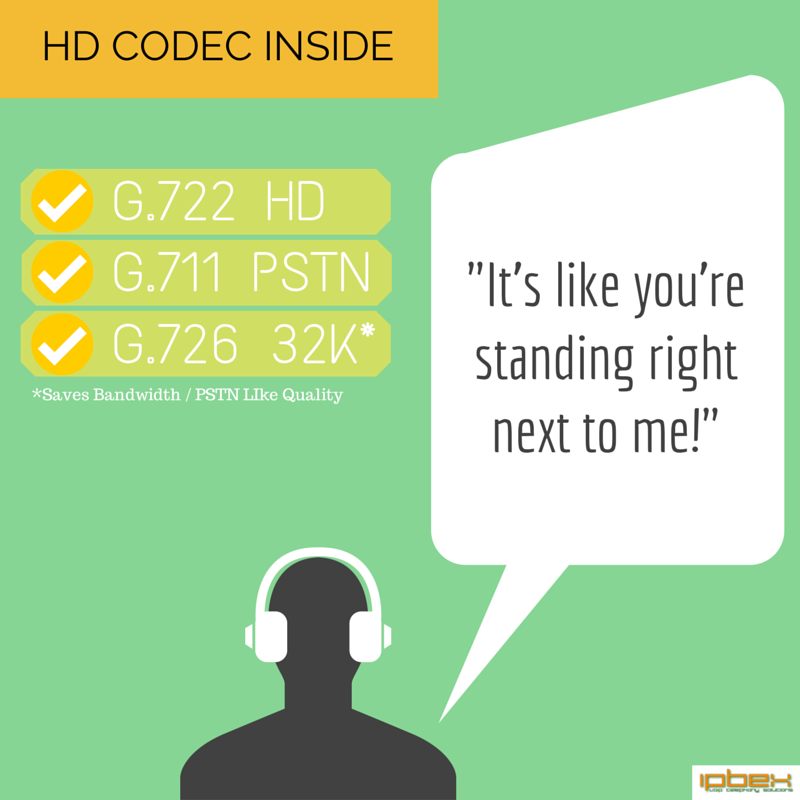 This HD codec processes the audio signal at double the rate of a traditional PSTN-like G.711 call; yielding a better-than-PSTN sound quality. Most describe an HD phone call as "sounding as if the person is right next to me" as the resulting audio is crystal clear. External calls on your Cloud PBX will select the Standard Definition G.711 Codec. G.711 offers great traditional sounding call quality. For the curious, selecting an HD codec for an external call would not be optimal as the other leg of the call is not HD; (ex: an external call to a cell phone). For bandwidth limited clients, we can hard code a more bandwidth friendly codec like G.726 (32K), reducing the bandwidth consumption to half that of G.711, while marginally affecting the voice quality. G.726 is not available on all VoIP phones. For unsupported models or if the least amount of bandwidth consumption is desired, we offer G.729 and iLBC. However, the quality gap is more noticeable, compared with high quality codecs like G.722 HD; especially when music / advertisements on hold are playing. Upgrade to HD Voice today.